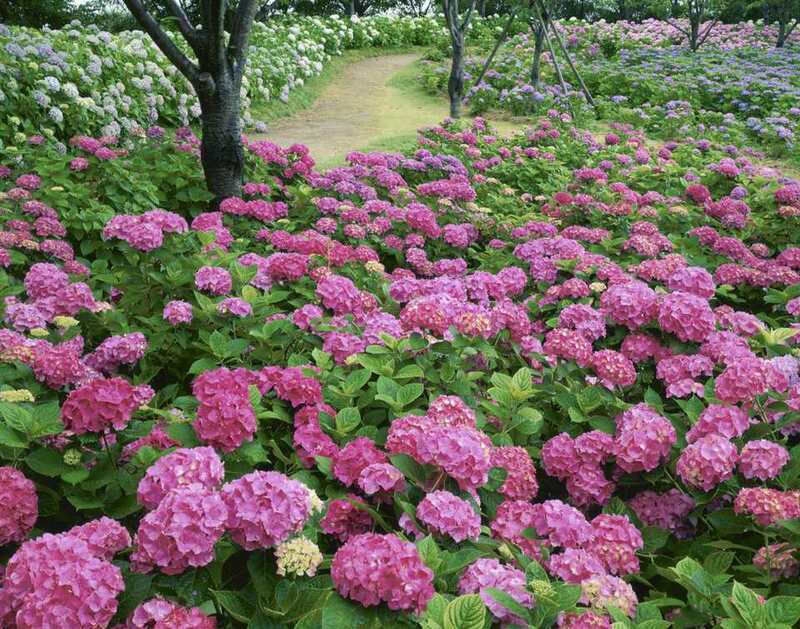 An explosion of new cultivars in recent years reflects the trending nature of hydrangeas. And, who doesn't want a shrub that resists most insect pests, grows in sun or shade, and bounces back from frigid zone 4 winters? This beloved shrub produces masses of large ball-shaped blossoms or fantastic panicles that fill up your vase, and some feature showy foliage shapes and fall color as well. If there is a universal downside to the hydrangea, most gardeners would agree that price is an issue. Although some online retailers sell inexpensive bare root plants, most premium hydrangeas are sold as container plants, and even the smallest containers are expensive, starting at $25 for a quart-sized plant. This puts dreams of a hedgerow on hold for gardeners who don't wish to spend hundreds of dollars on plants. The secret that most garden centers don't want to share with home gardeners is the ease with which hydrangeas can be propagated. The vigor and fast growth rate of hydrangeas extends to their cuttings. By taking a fresh cutting of your hydrangea, you can start a new plant that is identical to the mother plant. Cuttings are only a few inches long, so a mature plant could potentially yield dozens of new hydrangeas to fill up your sunny and shady garden spots. Taking a good cutting from your hydrangea for the purposes of propagation is a little bit art, and a little bit science. You should take your cuttings in the spring, when the plant's metabolism and growth are at their peak. Set aside time to prepare your cutting early in the morning or late in the evening, when heat stress won't claim your vulnerable stem while it's off the plant. If possible, take the cutting from a branch that isn't forming a bud. If the plant hasn't formed buds yet, don't worry; both blooming and non-blooming stems can develop as cuttings, but most gardeners don't want to sacrifice a single potential bloom on the mother plant. Use your cleanest, sharpest shears to take your cutting. Sanitize your shears with an alcohol wipe to ensure that no fungal disease creeps in to introduce mildew or other fungal diseases to your new baby plants. Choose a tender, green stem to take as a cutting. Stems that are woody and grey are less metabolically active, and will take twice as long to root. Make your cut about two inches below a leaf node. The leaf node simply refers to the point on the stem where the leaves emerge. In all, the stem should be about three to five inches long. If you are planning on making multiple cuttings, make full use of the branch you cut, as each branch may yield two or three cuttings before you get low enough to the ground to encounter the woody part. After you've trimmed your stem to the proper length, you may admire this piece of plant with its pretty leaves (especially on oak leaf hydrangeas). Never mind the attractive leaves, as they are a detriment to the stem you wish to root. Leaves that you might plunge into the soil would quickly rot and invite fungal disease to your new cutting. Remove these leaves with your pruners, being careful not to damage the stem in the process. You should cut the leaves right where the leaf stem begins to broaden into the fullness of the leaf, which allows the integrity of the stem to remain undamaged. After you've trimmed the lower leaves from the stems, your hydrangea cutting should look like this. Note the small nubs where the leaves were: all leaf parts are gone, but the stem itself was not nicked by the pruners. If your stem was damaged, discard the cutting and try again. It's not worth the disappointment of waiting weeks for the cutting to take root, only to experience root rot disease or some other failure to thrive issue. Your cutting is starting to look like something the slugs feasted on, but you aren't finished pruning yet. Until it develops roots, those big leaves are a liability to the hydrangea cutting. The stem is not anatomically equipped to deliver enough moisture to the leaves, so you must reduce the leaf burden with more trimming and pruning. Completely remove all but the highest two leaves that emerge from the tip of the stem. This tip is the part of the stem that is actively growing, and will be producing new leaves in another month or so. The final part of the leaf pruning stage is to cut your remaining two leaves in half. It's somewhat painful to administer this final injustice, and it may seem like you are doing more harm than good when removing so much life force, but as the saying goes, "Just do it!" When you've completed the necessary cutting and trimming of your hydrangea stem, this is what it will look like. Not pretty, is it? Now your stem can put all of its energy into making roots, instead of struggling to provide water to giant leaves. The formation of new roots is critical to a stem that has been removed from its primary root system. Now the hydrangea stem must form a secondary root system, also known as the adventitious root system. An adventitious root arises from a plant part other than a root, such as a leaf, or a stem. You may notice tiny nubs of adventitious roots along the above-ground stems of very vigorous plants like mint. When these stems are buried, these dormant roots spring into life, allowing the plant to propagate itself. Your hydrangea stem must summon these roots to create a new life separate from the parent plant. Before you plunge your vulnerable hydrangea cutting into a pot of soil, it's a good idea to dip the cut end into some rooting powder. Commercial growers depend on this treatment to produce new plants, but home gardeners can buy rooting powder or hormone for under ten dollars. So, what exactly is this stuff, anyways? Rooting aids, whether in powder or liquid form, usually contain the plant hormone auxin, which helps that secondary adventitious root system get going. Your commercial rooting aid may contain naturally occurring hormone, called indole acetic acid, or a synthetic hormone in the form of indolebutyric acid or napthaleneacetic acid. A powdered form of rooting aid has the advantage of being quick and sanitary. The liquid form has the advantage of offering a product with a very uniform consistency; however, the hormone concentration may increase in old product due to evaporation. If you don't have any rooting hormone on hand, you can also make a quick home remedy by using willow water, as the willow tree is a rich source of indole acetic acid hormone. Chop young stems and twigs of willow, and make a tea with boiling water. Let stand overnight. The next day, use this tea to help your hydrangea cuttings get a quick start. Use fresh tea each time for best results. It's time to pot up your cutting. There is a trend to start cuttings in water, but this is not advised for hydrangea cuttings. Cuttings started in water develop very weak root systems that falter when the need to transplant into soil finally arrives. Choose a pot that meets your space needs and the number of hydrangea cuttings you are starting. An eight to ten-inch terracotta pot will hold your cutting for a month or longer, or perhaps all season if you don't have a space for your new shrub yet. If you're starting multiple cuttings,and intend to transplant them into the garden as soon as the root system is well-developed, you can use an inexpensive nursery six-pack like those used for starting seeds. As with all flower gardening endeavors, the choice of soil is very important for hydrangea cuttings. Garden soil that you dig from the ground is an undesirable option, as this soil is typically heavy, and may be loaded with pathogens as well. A good option is sterile seed starting medium sold at garden centers. However, as it is usually filled with peat, it can be difficult to keep moist: peat mixes may look moist on the top, but be dry within the pot, something gardeners don't realize until they experience plant death. An alternative is to add a wetting agent, which helps hydrophobic (water-repelling) media like peat moss absorb water. Moisten your soil thoroughly before plunging the stem up to the base of the remaining leaves. Your new hydrangea cutting should be moist at all times, but never soggy. This is less tricky than it sounds if your potting soil has excellent drainage. A daily pass with the rain wand is sufficient for most situations. If your cuttings are in very small pots, in full sun, or in an exposed, windy area, you may need additional watering visits to prevent the cuttings from drying out. After about ten days, your hydrangea cutting will begin to form new roots, and won't need to perform such close monitoring. Hydrangea stems take well to propagating by cutting, and will reward you with a healthy root system within a month. After this, you can transplant your new baby hydrangea shrub from its pot to the ground in its permanent location. Remember to follow proper spacing guidelines when you install this deceptively small plant; you should plant most hydrangeas four to six feet apart. Now that you've experienced success with propagating the popular garden hydrangea, you can fill any blank spots in your landscape with vibrant flowering shrubs, and perhaps even share the wealth with some friends and family too.